A few weeks back, I sat on a panel at the Sales 2.0 Boston conference. The conversation turned to sales hiring. It made me think about something I'd recently read about -- specifically, Angela Duckworth (from University of Pennsylvania) and her research on grit. Dr. Duckworth defines grit as "sticking with things over the very long term until you master them." She writes that "the gritty individual approaches achievement as a marathon; his or her advantage is stamina." I mentioned this research and offered to work with any Sales Leader in the audience to score their reps on the grit scale and look for correlation with their best performers. Happily, Pete Gracey, COO of AG Salesworks (and my partner in The Outbound Index), offered to help. We designed a 90-second survey (based on the Grit Scale) which Pete shared with his team of 30+ outbound prospectors. 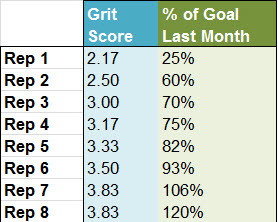 We then calculated grit scores on Duckworth’s 1-5 scale – the maximum score was 5 (extremely gritty) and the lowest score was 1 (not at all gritty). 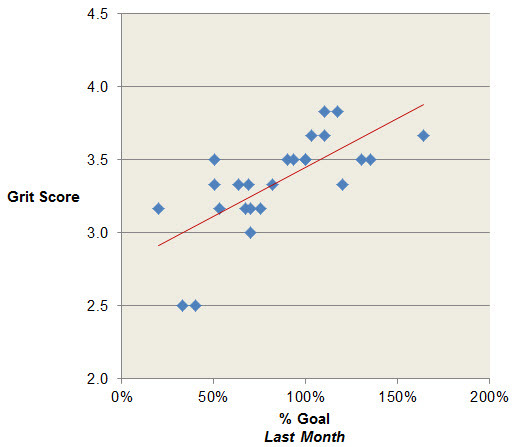 In eyeballing the results, it looked like higher grit score did correlate to better performance. Lest we be accused of junk science, we decided to take a deeper dive [boring details mostly withheld]. Does grit predict better sales results? Now I believe that most successful B2B professionals are pretty darn gritty. 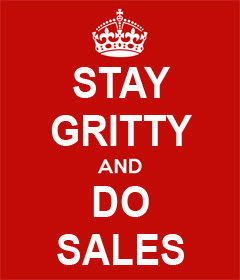 And sales reps are a very gritty lot indeed. But I wondered; would there be a statistically significant finding that the higher the grit score the better the quota performance? Longer answer: We were able to explain 49% of the variance in quota achievement by a linear relationship with grit score. These results were statistically significant (p ≤ .001). Net net: That grit matters in sales isn’t shocking. But the fact that Pete & I were able to demonstrate correlation to performance (with just a 90-second survey) is. Note: I am looking to test with a few other teams. For comparison’s sake I wanted to test a bit of conventional wisdom. There is a ton of advice on how critical it is to get at past performance when interviewing inside sales reps. I didn’t have any data on rep performance at their last sales job, so I decided to use the previous quarter’s results instead. If any kind of past performance should predict future results, it would have to be this – right? Longer answer: Through regression we were able to explain 33% of the variance in quota achievement by a linear relationship with previous quarter’s results. These results were statistically significant (p ≤ .001). Net net: Past performance seems, in fact, to be correlated with future performance. The conventional wisdom about former A-players seems to be true. The huge caveat here is: if the past performance isn’t directly translatable, you’ll probably notice diminishing returns. The notion that grit matters in sales makes sense. Sales is about adapting to a constantly changing economy, market & buyer. It is also about buoyancy and the ability to wipe the blood off your lip and carry on. Here's my takeaway from this little experiment: I think there should be a place in your hiring process for factoring in grit. In our world, talent is king. Our business is people and a hiring mistake has long-term implications. Grit is an attribute that matters to us and now that we’ve correlated it to success in tele-qualification, every candidate is going to have this handy little test slapped down in front of them before we extend any offer. Pete’s in. How about you?